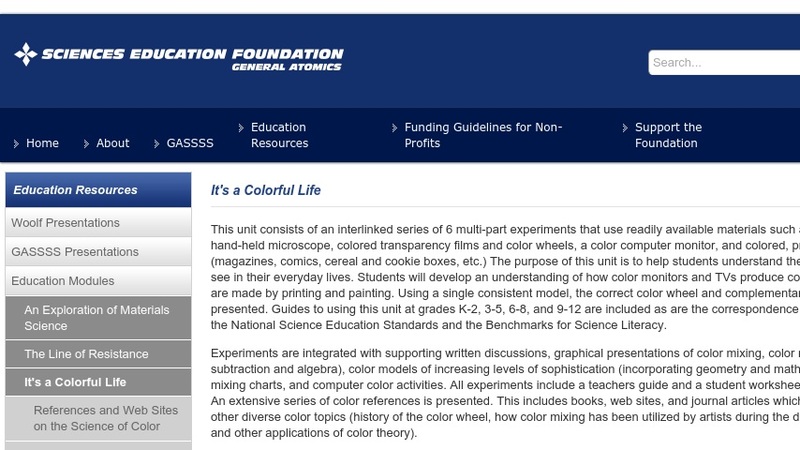 This page is a multi-day module for grades 8-12 on the topic of color. It was designed as a set of six interlinked experiments to explore how colors are formed by light absorption and emission. Activities include: physical models to experiment with additive and subtractive color and explore how objects reflect and absorb light; examining color mixing by using a simple Power Point tool called CMYK; using magnification to examine the dot colors produced by an ink jet printer, and more. Detailed lesson plans, student activity guides, and background information are freely accessible online. The module was developed to be used with a set of unique hands-on lab materials sold by the publisher, however, many items are readily obtainable from teacher supply stores. This resource is aligned with national science education standards and has been refined through classroom testing. This item is part of a larger collection of inquiry-based modules.